Is it large? Or small? Is it abstract or functional? Can it be a bench, a lamp post or a window? Is it a sculpture, a picture, a film? How can it change our daily lives? Where on campus would you put it? Could it improve our wellbeing? What do you think? The University of Reading is commissioning a series of new public art works for the campus. As we prepare to welcome our first artist later in 2019, we want to spark some curiosity and invite discussion about the what, why, where and how of public art. Join us! Drop by to take a look or have a go at our giant pavement chalk drawing! This project is led by Art Student Antonia Stanley, who has been on placement with Arts Development Officer Miranda Laurence. A short, fun and informal workshop to introduce different ideas of public art and ask what difference you think it could make at Reading! Nibbles provided, bring your lunch. Drop by to find out more about public art, what it could mean for Reading University and feed in your ideas. As part of her micro-residency at Reading University, artist Rachel Barbaresi invites participants to join a Tree Walk on campus, to collectively and creatively research the natural environment in which we live, work and study. Sign up in advance by emailing m.c.laurence@reading.ac.uk; please wear appropriate clothing and foot wear! Multi-disciplinary artist Tai Shani talks about her work in this regular series of talks from the Art School. This project is led by Art Student Antonia Stanley, who has been on placement with Arts Development Officer Miranda Laurence. Pick up a #Whatispublicart postcard, respond to the question on the card, and post it in the special post boxes in the Library Foyer. You can be entered into a random prize draw! Postcards and other design has been produced by Typography student Jack Marvell on the RealJobs Scheme. 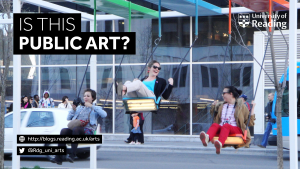 Look out for #Whatispublicart on Twitter, follow @Rdg_uni_arts to respond with your images and ideas about public art on Reading’s campuses. This project is led by Museum Studies student Gracie Price.